Who could have predicted that Peter Farrelly, one half of the brotherly team that made such crass (and guiltily enjoyable) comedies as THERE’S SOMETHING ABOUT MARY and DUMB AND DUMBER would make an Oscar-touted movie in 2018? With GREEN BOOK, Farrelly has shown us that he’s got more than just one trick up his sleeve. 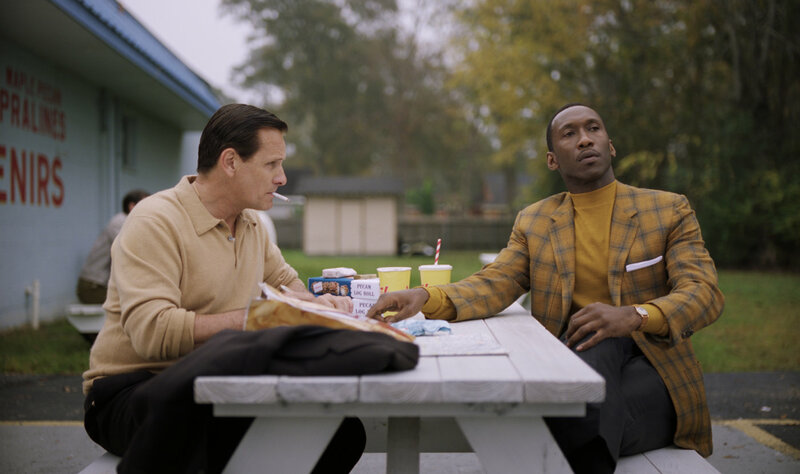 GREEN BOOK tells the little known story of concert pianist and composer Dr. Donald Shirley (Mahershala Ali, MOONLIGHT; HIDDEN FIGURES) and his relationship with his driver and bodyguard, Tony “Lip” Vallelonga (Viggo Mortensen, THE LORD OF THE RINGS trilogy; EASTERN PROMISES). The two meet back in 1962 when Dr. Shirley decides to embark on an eight-week tour of the southern US. As a Black man in the Jim Crow South, travelling alone is a dangerous proposition, so his record company insists that he hire someone who could protect him. (Six years earlier, Nat King Cole had been assaulted on stage while performing for an all-white audience in Birmingham, Alabama.) Tony, who is a bouncer at the Copacabana in New York City, has a no-nonsense reputation that precedes him. The two strike a deal and off they drive, with Dr. Shirley in the car’s back seat. It isn’t an easy alliance though. Tony hates Blacks and Dr. Shirley hates ignorance. But they need each other more (Tony, for the money) and the two agree to set aside their differences as best they can. As the pair gets to know each other better and deals with the racism and intolerance that is endemic in the South, they begin to form a bond of friendship that continues for fifty years. Whether you call it “Driving Dr. Shirley”, “My Fair Tony” or even “The Odd Couple”, GREEN BOOK is a thoroughly enjoyable period buddy road trip that is elevated by the wonderful chemistry between the film’s two leads. I’ll concede that it’s not a perfect movie, and I can see why many Black people are upset about this being yet another film about a Black person as seen through the eyes of a White. We learn a lot about Tony here but not so much about Dr. Shirley. As well, not just Tony but also his whole family (except for his wife who apparently was always woke) seem to have their prejudices laid to rest far too easily in the film’s closing scene. But here’s the thing: First, the screenplay was co-written by Tony’s son, Nick Vallelonga, so of course it will focus more on Tony than on Dr. Shirley. And second, the reality is that there just isn’t very much information available on Dr. Shirley. He was an intensely private man and he apparently asked the young Vallelonga not to publish anything until after his death. In one scene, Dr. Shirley mentions an estranged brother, yet he had five siblings. It could be that he guarded his private life so fiercely that he didn’t tell Tony the truth until much later on in their relationship. Yes, Tony plays the White saviour and Dr. Shirley plays the wise Black sage here but if it means that both Blacks and Whites will now “discover” Dr. Shirley’s music or learn about the history of what Green Books were or maybe even just get two divided people talking to each other again, then this film has done a service. Even SCHINDLER’S LIST, with its problematic Christian saviour imagery, continues to educate people around the world about the Holocaust and tolerance twenty-five years after it was released. It also led to the creation of the USC Shoah Foundation. All that aside though, both performances are top-notch but Mortensen’s is Oscar-worthy. I don’t think we’ve ever seen him this animated. The actor reportedly gained a whopping 45 pounds for the role. Tony, apparently, loved to eat, whether it was a whole pizza pie folded up like a newspaper or a greasy bucket of fried chicken. At the end of the movie, photos of the real Tony and Dr. Shirley are shown. Tony loved life and lived it large! GREEN BOOK is solidly in my Top 10 films for 2018. It’s on limited release in Hong Kong right now and will go into wider distribution starting on January 24th. You don’t want to miss it! Watch the review recorded on Facebook Live on Thursday, December 13th at 8:30 am HK time!